When I first married my husband, I was delighted to discover among his possessions a copy of Isaac Asimov’s Treasury of Humor. I had read the book in high school and enjoyed reading it again, this time discussing it extensively with my husband. 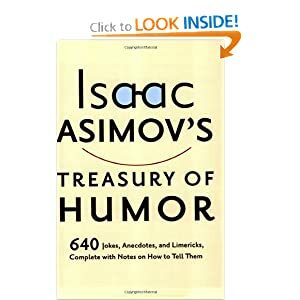 Not only does this book contain jokes–great, classic ones–but Asimov explains why they’re funny, how to tell them, the origin of them, and if there are different versions. He explains the differences between shaggy dog stories, puns, black/gallows humor, and so on, and what makes each type tick. Asimov does this all in a chatty way that reminds you of your great-uncle shmoozing with you–it’s just so much fun. Flash forward a few years. My husband and I start to write an annual fake newspaper, called The Purim Spiel. For those of you don’t know your Jewish holidays, Purim is a rollicking holiday of celebration, costumes, junk food, and jokes that memorializes the rescue of the Jews in Persia more than 2000 years ago. Hubby and I decided to pack the newsletter with joke after joke in the form of fake news, pseudo-advertisements, and craziness. The Purim Spiel, thank G-d, has been blessed with much success and is enjoyed yearly by our friends, family, and neighbors. So, if you’ve never read Isaac Asimov’s Treasury of Humor, just do it. If you don’t like profanity, just skip the chapter on dirty jokes. Most of the book is clean. It’s an invaluable resource for writers (and conversationalists, and public speakers…). By the way, anyone who wants to read last year’s (5772/2012) Purim Spiel can email me, and I’ll send you one. Since it’s officially one month ’til Purim, there are probably other people out there writing Purim Spiels of various kinds. Anyone else want to share how to be funny? ← On Writing About Writing: a guest post by Miriam Hendeles, author of Mazel Tov, It’s a Bubby! Love this topic! Joke books are ubiquitous in our home. Isaac Asimov was a great humorist. What makes a joke a joke? Irony, timing, the unexpected, play on words..